Today I've just been thinking about life. How grateful I am for our lives, for Clara's life, for Jesus' life. I guess that's what Easter is all about. I'm very thankful to have celebrated this Easter with Clara and to be in a place where we feel certain now that she will have more life ahead of her. Robert wrote yesterday about what a wild month it's been and he's right - it's hard to believe how far we've come and how much we've been through this past month. And yet, it doesn't compare to the life, betrayal, death and resurrection of our Savior. Suffice it to say, Easter was extra special this year. We are so deeply thankful for Jesus' life and the example He was for us during His time on this earth. And we are thankful for God's willingness to sacrifice His life on our behalf and then for the incredible miracle of His resurrection. We are experiencing our own Easter miracle and it's just making the reality of salvation even more powerful and meaningful for us. Medically speaking, Clara had a pretty good day. By this morning they had weaned her Nitric Oxide down to 2 (we started at 20, so that was a pretty quick wean). They planned to take her Nitric all the way off at about 12:00, but when we did it, Clara let us know that she did not approve. She very rapidly desated and turned gray and wasn't breathing. It was a little scary. Fortunately, all the doctors were standing around and they bagged her (manual ventilation), ended up turning the Nitric Oxide back on again and she did recover. Other than that little incident, her sats have stayed pretty high today and she's been good. We have been able to wean some other vent settings and have continued to wean hydrocortizone, too. We went back up to 4 on the Nitric after her little hissy fit and up on her oxygen too, but we are going to keep trying to wean both back down. The goal is to have the oxygen down to 60% (last I talked to the nurse we were at 72%) and will wean the Nitric by 1 every six hours beginning at midnight (12:00am- we go to 3, 6:00am go to 2, 12:00pm go to 1, and 6:00PM tomorrow, try turning it off again...) We're hopeful that she will tolerate this slower wean and we'll be able to have the Nitric turned off by tomorrow evening. Other than that, we just continue to check blood gases and wean vent settings with hopes that we'll be able to extubate sometime this week, whenever she shows us she is ready. She is still not consistently tolerating moving and messing with her. Her sats dropped some today during a diaper change/repositioning and sometimes when she needs to be suctioned she gets a little finicky. She has been desating (usually not too serious and with relatively quick recovery) 2-3 times a day. So we also just need for her to show us that she can keep her oxygen saturations consistently higher before we extubate because saying goodbye to the ventilator is another safety net removed. She continues to diurese well. Today she was down to 5.3kg (11.6 lbs) from 5.6kg yesterday. Her birth weight was 3.7kg, so we're aiming for somewhere between that and 4kg. Tomorrow she will have that triple lumin central line in her neck removed and a new line put in her chest called a broviac line. This procedure is fairly routine, but we did have to give consent for it and hear the list of potential complications, so please pray that goes smoothly. It is a surgical procedure. The neonatalogist who has been caring for her since we arrived in the NICU on Tuesday is Dr. Yang. She has been wonderful and really given Clara excellent care while helping her make great progress. Tomorrow, a new attending will take over service so we'll have to learn the style/philosophies of a new doctor and see if that will change any of our strategies. Please be in prayer about that transition, too. She had some more alert and awake time today - a little bit this morning and again this afternoon. It's great to see her be awake and look around and interacting some with the world around her. This afternoon, we left the hospital a little earlier than usual and left Big Daddy and Sweet Mama in charge of watching Clara. It felt like leaving her with a babysitter for the first time. I had a big list of things for them to watch and keep an eye on and make sure the nurse did and numbers I wanted reported back to me. Don't worry, they did a great job. It was nice to come home and get a little nap in. For those concerned about my mastitis, I'm much better today. I started an antibiotic last night and the fever is gone. I've just been pumping a lot more frequently, am doing the whole warm compress thing, and am riding it out. As I told my mom last night, "Don't worry about me. Clara is a whole lot sicker than I am!" Now, what you've really been waiting for. Easter photos of Clara! 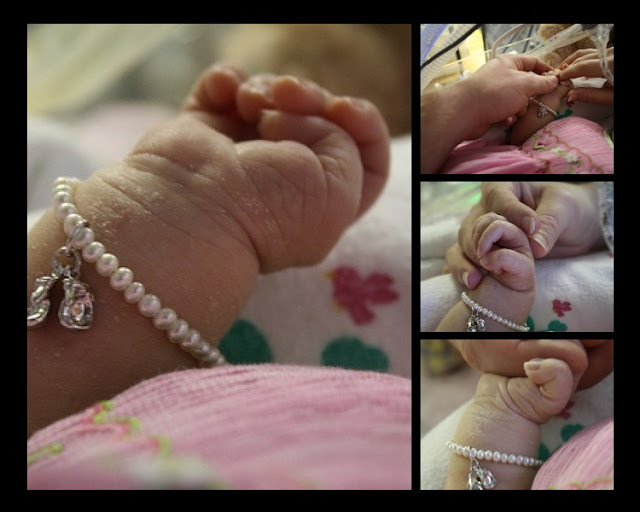 Her Mama K gave her this precious pearl bracelet for Easter. That charm is boxing gloves - for our little fighter! Those big blue eyes say, "Happy Easter to you!" - Continued diuresis, and especially that the fluid will leave her lungs, then her tissues, then her body. Her chest x-ray the last few days has looked very wet and showed some partial lung collapse from all the fluid. We need the fluid gone! For good! This Easter, we are so glad to say that God conquers death! Praise be to Him! Life is sweet. Aww... tears of joy tonight! I just started to lose it when I saw her in a little dress! (Adorable!) Happy Easter sweet Clara, Chrissy & Robert! My heart is full and happy! Love and prayers to you all. She is absolutely beautiful! God is SO very good and He is showing the world His love through you and Clara! He reminds us daily how much He loves us through His healing power. I am praying for continued healing and Clara's testimony to shine day by day. Prais Him in all the little things they add up to BIG ones! Each day Clara changes so much in her pictures! Sounds like she is doing well even though she had to go back on NO, I think she is doing great. Clara has made such strides and as the fluid comes off, her body adjusts, she will jump more hurdles. Know we are praying for ALL of you throughout the day and thanking our Lord this very special Easter for Miss Clara and her parents. What a beautiful family pic of you three! 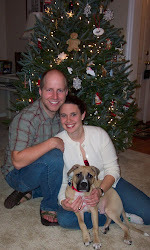 A pretty little girl and adoring parents! What could be any better. Will continue to pray for progress as God heals her and restores her so that you can HOLD her and take her HOME!!!! Keep up the good work Clara, we are all rooting for you. We are so glad to see her improving. I love her little pink dress. Clara looks back to normal and I am so glad to see that too. It was a joyfull Easter for all. So glad Clara is progressing well. I love the daily pictures and feeling part of her recovery process. She is so sweet and lucky to have such a wonderful family both medical and biological taking care of her. She's looking great. Happy Easter to you all. Clara's Easter pictures are wonderful!! I love her little bracelet with the boxing gloves, she is such a fighter. I continue to pray every day and every time I think about her. I am thinking about all of you and just admire how strong you have been through all of this.....GOD IS GOOD, and he is showing us what prayer can do! My love to all of you!!! I enjoy reading these updates all the time, my daughter I are praying for you guy when we go to bed. We are praying for you guys. Love seeing the pictures of Clara in her Easter dress. Hope you don't mind, I nominated you for a mother of the year award. What a special Easter! I know you were thrilled with everything that has improved, but it must have been so fun to put her in that beautiful dress for the first time! I KNOW that the Easter Bunny gave at least HALF of his goodies to sweet baby Clara! As a matter of fact, he is probably still hopping around there, too in love to leave!!!!! You might have to keep this blog going for the rest of her life as we are ALL in love with her, too, and will want to follow her life's journey forever!!!! I KNOW it is going to be amazing!!!!!!! Glad to see Clara is doing well!It's crazy because when I read Clara's updates I can't help but think how similar her journey and Grace's are. Grace had her broviac placed during her decanulation, I hope Clara's placement is a smooth process, we are heading to the OR sometime this week too. Prayers for Clara to continue moving forward! Wow! I am so amazed to see how much Clara has improved, you can really see it in the video. Thank you for allowing to watch her progress. Go Clara.!!!!! Prayers as always for continued good days.